Weight:5 Lbs Meets Marine Standards for Fresh / Saltwater Use. The GL-2051-F-M Golight Radioray from Larson Electronics is a 65 Watt motorized spotlight/floodlight combo that operates with a wireless hand held remote control. This particular model is available in black and is magnetically mounted. It produces a wide spot beam with an effective working beam of 700 feet and has a 5 million candlepower rating. The GL-2051-F-M Golight Radioray is designed for use in all weather conditions and produces 1,300 lumen of intense light output. These units feature remote control operation that allows users to rotate the light 370 degrees with a hard stop and to adjust vertical tilt through 135 degrees. Remote operation is provided by a wireless hand held remote control. The hand held remote measures 3 inches long by 2 inches wide by 3/8 inch thick. 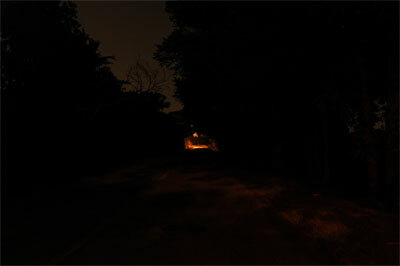 This image shows a dark road with no illumination but the moonlight and a distant street light. This image shows the same road, illuminated by the FLOOD configuration of the Radioray, a wider, softer area of illumination closer to the user. Remote Operation: Remote control functions include on/off and 4 buttons which control up, down, left and right movement. The light will continue movement as long as the buttons are pressed. Releasing the buttons stops movement and holds the Golight in position. A fast and slow mode button (turtle/hare) controls the speed of the motor while the pan and tilt function buttons are depressed. Holding the button for 12 seconds in fast mode results in pinpoint accuracy at distance and is approximately 35 seconds for full rotation and 20 seconds for full range of tilt. Durability: The GL-2051-F-M Golight Radioray is designed for hunting and demanding outdoor use with a weather resistant housing constructed of high quality ASA Luran thermoplastic that is heat resistant, impact resistant, UV resistant and able to withstand rugged use and abusive conditions. This particular Golight is black in color, making it ideal for docks and buildings where an attractive appearance is desired. Remote movement of this spotlight is provided by an automotive grade internal motor, gear, and transmission assembly that is constructed of lexan, brass, and stainless steel to provide rust and corrosion resistance as well as long life and reliable operation. Mounting: The light is magnetically mounted with a 200 pound grip magnetic base that is tested for speeds up to 85 miles per hour. Power: This light operates with 12 volts DC and draws 5.5 amps, making it ideal for consumer vehicles, boats, ATVs, and similar sources of 12 volt direct current. On this particular model, the light ends in a 16 foot cigarette plug. Light Output: The lamp in this Golight is a 65 watt Halogen Cr5 Pentabeam II bulb which produces 1,300 lumen. This lamp has a 6000K color temperature, giving it very good color rendering and contrasting properties and the ability to clearly and sharply illuminate objects at long distances. It produces a long, wide spot beam with an effective working beam 700 feet. New Flood Design: With a new flood design, the operator can remove the flood lens for a narrower spotlight beam reaching 700 feet in distance. Two tabs lock the flood lens into place to create a beam 120 feet long by 100 feet wide. 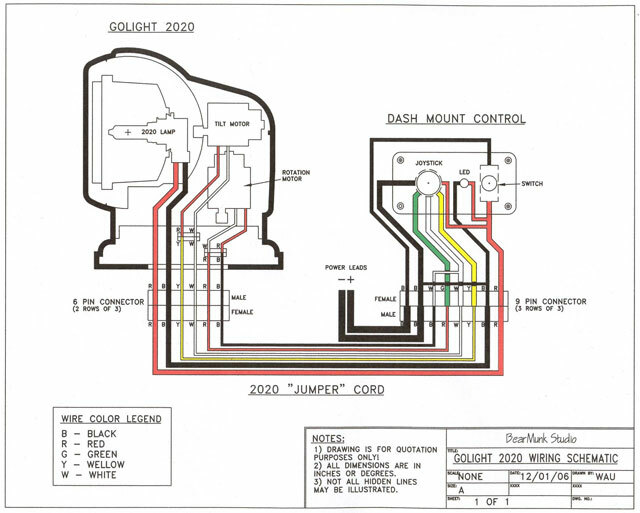 The operator can push back on the locking tabs to remove the diffuser lens, revealing a narrower, directed beam that reaches to 700 feet in distance (250 feet wide at its widest point). This high power Golight is ideal for hunting, security, boating, law enforcement, emergency services, utilities, and anywhere high power and remote control functionality are desired.